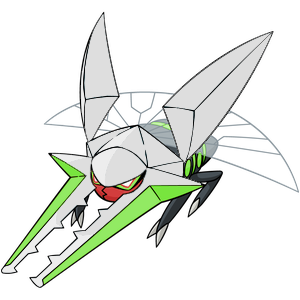 What is a good moveset for Vikavolt? 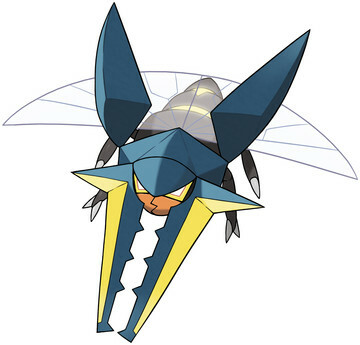 If you have a good moveset for Vikavolt, post an answer below and upvote the best ones. Remember, this is for competitive movesets, not in-game. Ability, EVs etc should be included, and we encourage sets for VGC doubles as well as singles. Make sure to read all the guidelines here. Vikavolt Pokedex & learnset for reference. You know the drill. Dual STAB plus Flash Cannon is excellent coverage, the rest is simple. Not awful Speed if used in NU. EDIT: I cannot think of an instance in which you need all 252 EV's in Speed to outspeed any certain Pokemon at +2. That being said, you can take out some slow threats who are deficient in Sp.Def with 203 Speed using the above EVs, without Agility. EVs: 20 Def / 252 SpA / 236 Speed. Unboosted, this has a total of 199 Speed. This, at +2, should be enough to outdo Jolly/Timid Choice Scarfed or +1 Pokemon up to base 71 Speed. That sounds alright in NU, right? Plus, those Defense EVs will come in more handy than you think on neutral hits. I know this is a fairly standard set, but it seems to work for me. I've tested extensively on Showdown. I run a team with Sticky Web, and it's evs allow it to outspeed most sweepers, even with them having a speed boosting nature, minus a Scarf. I love the versatility in terms of how many types get hit hard by a base 145 Sp Atk. I chose Energy Ball over Hidden Power, to abuse the fact it can safely switch in on a ground type move, as long as the Pokemon using it, doesn't have Mold Breaker. It then gains the ability to hard switch out, or Volt Switch out, giving it great momentum building. Contrary to other people's opinions, a Scarf is a viable option, with the right team support. A team with other hazard setters, and a Rapid Spin user, could provide a great balance. I love his amazing Special Attack and great movepool, but the only thing that Saddens me is that he has such a Low speed that a Choice Scarf on it won't change anything. So 252 EVs in Hp was the obvious choice to allow him to survive hits before attacking. Thunderbolt and Bug Buzz for STAB, while HP Water covered both of his weakness : Rock and Fire. The others are coverages. Suggested to have Stick Webs on field. This VGC set is fantastic, it tanks even 252+ Sp. Atk arcanine and offers great support with string shot giving -2 to ALL your opponents pokèmon in speed. Having 145 base Sp Atk can take down the majority of the pokèmon that doesn't resist electric in 2 hits so it doesn't need lot of Sp. Atk. investments. The iapapa berry grants 50% of health recovery when the hp go down 25%. Why should it have X-Scissor? 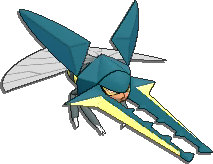 That's a physical move, and Vikavolt is a special attacker. You should probably replace that with Bug Buzz. EV reason: The moveset is purely Sp. Atk based and the Sp. Def and HP aren't very high. Nature reason: Modest has low attack, which doesn't matter for the moveset, and high Sp. Atk. Well, It already has maxed out Sp. Atk so it doesn't need any more Sp. Atk boots. Maybe give it a focus sash or Sitrus berry.